The conceptual direction for this beautiful exhibition was based on the curatorial brief, emphasising a reverent display that reflected the high master artists of Europe. Utilising a predominantly black and white palette, highlighted with a massive gold wall to draw on the reference evoked by gold European Masters gold frames. This palette allowed the subtle and intricate colours of the bark painting ochres to be the hero for the viewer. Labels and graphics were designed to be high art but never to dominate the work which was paramount. Huge tree like structures created extra plinths to house paintings while giving a nod to the trees which the artists drew their canvas materials. 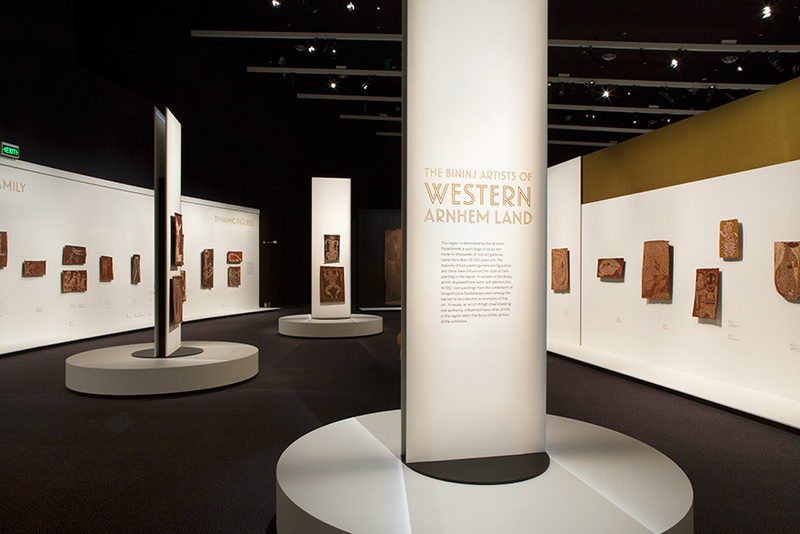 The artists names were softly highlighted on a graphic wall, to emphasis that this was an Indigenous exhibition afterall.